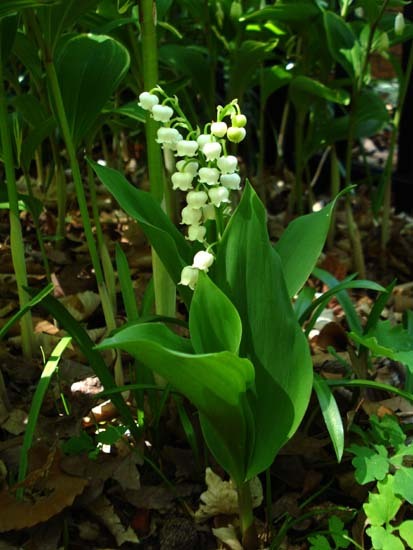 Distribution and habitat: Convallaria majalis is a sweetly scented woodland flowering plant that is native throughout the cool temperate of Northern Hemisphere in Asia, Europe and in the southern Appalachian Mountains in the United States. It can be found growing wild in dried and young forest heaths, ridges, forest margins, rocky ridges, banks, broad-leaved forests or coppices. Description: Convallaria majalis is a herbaceous perennial plant that forms extensive colonies by spreading underground stems called rhizomes. New upright shoots are formed at the ends of stolons in summer, these upright dormant stems are often called pips. These grow in the spring into new leafy shoots that still remain connected to the other shoots under ground, often forming extensive colonies. The stems grow to 15–30cm (6-12 inch) tall, with one or two leaves 10–25cm (4-10 inch) long, flowering stems have two leaves and a raceme of 5–15 flowers on the stem apex. 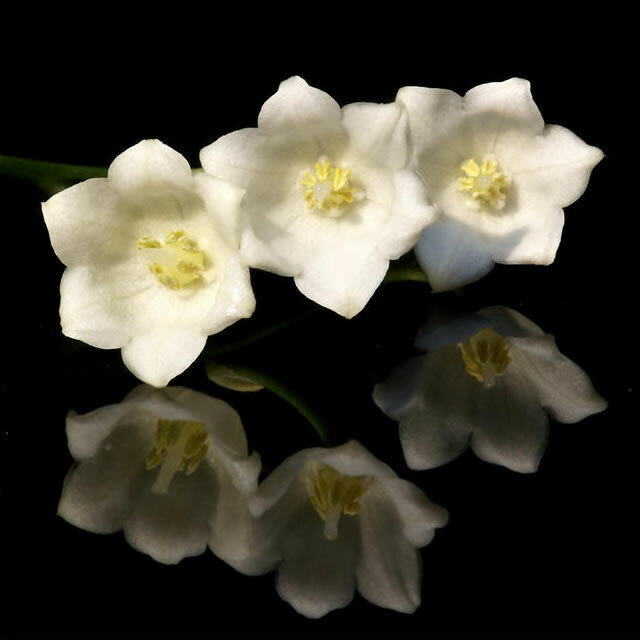 The flowers are white tepals (rarely pink), bell-shaped, 5–10mm (0.2-0.4 inch) diameter and sweetly scented; it flowers in spring. The fruit is a small orange-red berry 5–8mm (0.2-0.4 inch) diameter that contains a few large whitish to brownish colored seeds that dry to a clear translucent round bead 1–3mm (0.03-0.1 inch) wide. Plants are self-sterile, and colonies consisting of a single clone do not set seed. 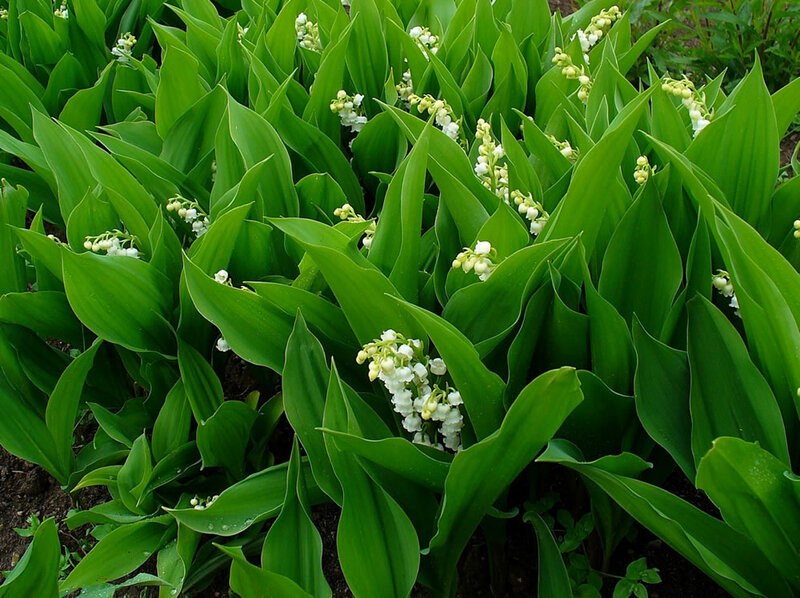 Convallaria majalis flowers will bloom for about 4 weeks, then can be brought back into bloom the next year. They definitely are more suited to cold climates and will bloom best after a hard cold winter. Garden Culture: After blooming has finished for the season leave the foliage in place; it makes a nice green ground-cover. Only the leaves that yellow later in season may need to be removed for esthetic maintenance. Convallaria majalis will rest for a few months before beginning the next growing cycle in spring. Lifting and storage is not necessary. However if desired lift and divide during the late autumn months while dormant. Store temporarily in moist peat moss or replant immediately. They will take a few years to become established and are best not disturbed. Position: Plant the pips or rhizomes in a place where they will receive partial to moderate shade. Soil: Find a location where the soil drains well. If the soil is not well drained can be amended with the addition of organic material to raise the level 5-8cm (2-3 inch) to improve the drainage. Peat moss, compost, ground bark or decomposed manure all work well and are widely available. Soak the pips in tepid water for a couple of hours before planting. The pips will absorb water, swelling and becoming hard. Before tucking the pips into the planting medium, snip the last 3cm (1 inch) off the roots. This process will encourage the roots to uptake moisture and start the growing process. Plant Convallaria majalis so the tops barely poke above the soil surface – 5 to 8cm (2-3 inch) deep. Pips can dry up if left out of the ground (and out of a humidity controlled cooler) for more than a week. Space the plant about 20cm (8 inch) apart. After planting, water generously, soaking the soil to settle it around the roots. Top growth will begin to form quickly, usually in just a week or so, depending on the temperature. Irrigation: Provide supplemental water, as needed in the spring, summer and fall. Occasional deep waterings are better than frequent lighter drinks. These plants like soils that provide average amounts of moisture, but will not be happy in water logged settings. They are not drought resistant. Fertilising: Apply a generous mulch of composted leaf mould around the base of the plant in autumn. 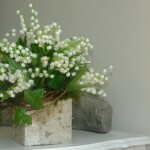 Pots, barrels, tubes & urns: Convallaria majalis flower early in the season. For ongoing colour use large colored containers where to place along with these plants some small pots with Incarvillea delavayi (Hardy Gloxinia) and dwarf hardy Canna species (Canna Lilies). Wait till the foliage turns yellow and withered, then cut it back. Do not pull the leaves off with hands. Use sharp scissors or pruners to avoid damaging the rhizome. Put the dormant plant in a cool, dark spot giving it just enough water to prevent the rhizomes from drying out completely. Position: Place the potted plants in light to medium shade. Indoors, a north or east facing window is a good choice. 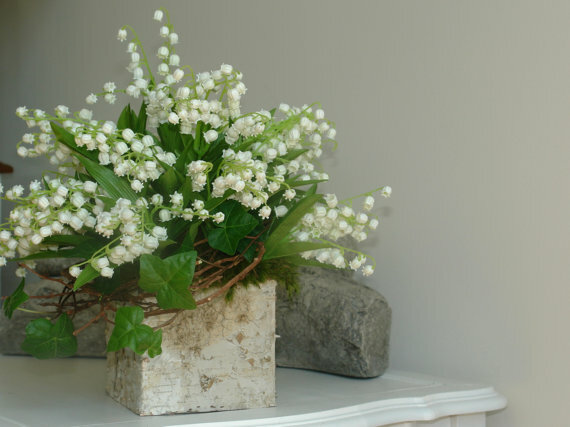 When in bloom, move the potted Convallaria majalis to a spot where can be displayed its tiny bells and sweet fragrance. Potting mixture: Fill the containers with good quality, well-drained soil. Almost any commercially available potting mixture will work fine. Make sure there are adequate drainage holes so the soil does not become waterlogged. Before planting, soak the pips in tepid water for a couple of hours. Snip the last 3cm (1 inch) off the roots. Pot 5-6 rhizomes together for an attractive planting. Place the rhizomes horizontally, root-side down and top with just enough soil to cover the rhizome. Watering: Water the plants moderately at regular intervals. Feeding: Feed monthly with a balanced liquid fertilizer diluted by half while plant is growing. Do not feed while dormant. Houseplant care: These types of lilies are easy to force into bloom indoors in the middle of winter. Potted flowering pips can be grown indoors for an enjoyable scented pot. Keep the pot in a warm, bright spot and keep the soil lightly moist. Blooms should appear in 6-8 weeks. To encourage these plants blooming for as long as possible indoors, keep them in a cool room as the heat speeds up biological processes. After the plants finished their bloom, replant them outdoors to enjoy them for years to come. Propagation: Convallaria majalis grow from creeping rhizomes that spread quickly under the soil. Divide these plants when they become crowded in autumn or spring. Cut the rhizomes apart, leaving some roots attached to each piece. They can grow from seed as well. Seed, pops (rhizomes) and potted plants are available at nurseries and garden centres. Cutting flowers: When in bloom, feel free to cut the small bell-shaped flowers for bouquets. This will not hurt the plants and the bouquets will last for three to six days. Cut the flowers when have three or four bells open at the base. The flowers are most fragrant when they are fresh. Check the water level daily and add warm flower-food solution as needed. Recut stems every two or three days to ensure effective water uptake. Remove any damaged or drying florets. Display the flowers in cool location, out of direct sunlight and away from heat vents. Aphids are the biggest problems. Treatment: Use an insecticide if aphids are noticed. Snails and slugs can be a problem. Toxicity: All parts of the plant are highly poisonous, including the red berries. Keep away from children and pets. 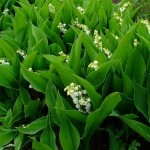 Note: The rhizome rooting system of the lily of the valley forms a fibrous network underground. Each year, new shoots appear above ground. Because the plant’s root system grows deep in the ground, it cannot be cleared out by simply pulling on the leaves even if some rhizomes are attached. That deep running network of roots and rhizomes can spread to the point of being classified as invasive. Uses: Convallaria majalis is an excellent ground cover and can be grown under trees in shade. The flowers make good cut flowers. These flowers are some of the best for small, scented bedside bouquets. Also is suitable for pots, barrels, tubes & urns placed to windows or doors to bring some their scent inside.